One more Windows Phone hurrah for Huron? Samsung has another new phone in the works, and the rumor that it's a Windows Phone handset has just been corroborated by one more source. But the serial tipster with the Twitter account @evleaks has also added some new details, including the claim that the Samsung Windows Phone is for US carrier Verizon. On top of that, it's even got a codename now: "Huron." So we can stop referring to it as the Samsung SM-W750V. Finally - and this may be the most tantalizing tidbit - the Samsung "Huron" apparently "looks very similar to a late model Galaxy S."
From what's known so far it seems the Samsung Huron will be a high-end 5-inch 1080p running Microsoft's mobile OS. Strangely, "Huron" was also the name of an old Intel processor, though that may be nothing more than a coincidence. The Samsung SM-W750V first popped up in December, when the device's model number appeared on an India website's shipping manifesto. Granted, that was pretty thin; but in January it appeared again, and this time with more specs and firmer ground to stand on. 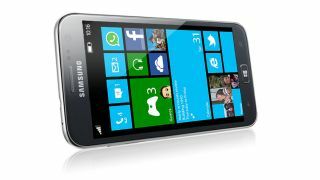 Samsung has been focused on Android for some time, while Nokia has enjoyed being king of the Windows Phone scene. But it's not like these are wholly unexplored waters for Samsung - its last Windows Phone handset was the Ativ S Neo, after all. Conversely, Nokia was rumored recently to be working on an Android phone alternately called the Nokia X and Normandy. It's truly a crazy world. The Samsung Galaxy S4 is the company's latest flagship - don't miss TechRadar's review!